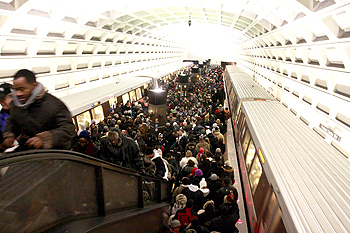 Passengers crowd a Washington, D.C. Metro station. The FBI's arrest of Farooque Ahmed of Ashburn, Virginia, for allegedly assisting al Qaeda in planning multiple bombings around the nation's capital, paints a sobering picture of the threat we still face from jihadists. The FBI charged the 34-year-old computer engineer, husband, father of one and naturalized U.S. citizen with "providing material support to terrorists and collecting information for a terrorist attack." Emphasizing the gravity of the case, U.S. Attorney for the Eastern District of Virginia Neil H. MacBride remarked that Mr. Ahmed was "accused of casing rail stations with the goal of killing as many Metro riders as possible through simultaneous bomb attacks." Throughout the summer and fall, U.S. authorities witnessed a significant rise in jihadist activity, using increasingly sophisticated operational strategies. According to open-source reports, between 2001 and 2008, U.S. agencies stopped one or two terror attempts a year. However, from 2009 until today, the government has been uncovering one or two cases a month, a troubling growth in jihadi activities. The deep concern of citizens and law enforcement personnel is understandable, but the concern is not merely that a man from Ashburn purportedly is engaged in terrorist activities, but rather that there is jihadi activity in the United States at all. The information available on jihadi operations around the United States suggests that authorities are witnessing a coordinated terrorist strategy that focuses on our urban centers. The FBI's indictment states that Mr. Ahmed agreed to conduct surveillance and take photographs of the Arlington Cemetery Metrorail station and a hotel in Washington for the purpose of gathering information about security and the sites' busiest periods. Mr. Ahmed allegedly also participated in surveillance, recording images of the Arlington Cemetery Metro station on July 7. The following month, Mr. Ahmed is said to have participated in surveillance of the Courthouse, Pentagon City and Crystal City Metrorail stations just outside Washington. These descriptions of Mr. Ahmed's tasks correspond to calls by al Qaeda leaders to conduct strikes in U.S. cities and to similar actions the group and its affiliates have undertaken in many parts of the world. "During a meeting at a hotel in Herndon, Virginia, on September 28," the indictment reads, Ahmed "suggested that rolling suitcases be used instead of backpacks, and he said that he wanted to kill as many military personnel as possible." The plan closely resembles past attacks, such as the train bombings of Madrid in 2004 and London in 2005. More important, the plot is consistent with the standing orders of al Qaeda and other jihadists to attack U.S. military personnel. The planned attacks appear to reflect an undeniable devotion to jihadi ideology. "Between April 2010 and October 25," the indictment reads, "Ahmed repeatedly met with individuals he thought were affiliated with al Qaeda to discuss 'jihad.'" "On May 15, in a hotel room in Sterling, Virginia," it continues, "Ahmed told one individual that he might be ready to travel overseas to conduct jihad, but only after he completed the Hajj pilgrimage to Saudi Arabia in November." U.S. authorities still struggle to understand the jihadists we face and how they are indoctrinated. Though they have not all traveled through the same physical locations, they share inspiration from al Qaeda leaders and supporters, including Ayman al-Zawahri, Anwar al-Awlaki and Abu Musaab al-Suri. Radicalization produces urban terror. From ideological incitement come cadres of jihadists committed to action. How many terrorists are involved in similar activities around U.S. urban centers right now? As the arrests accumulate, they sound a warning that the number of jihadists inside the United States is growing and the would-be bombers are preparing attacks more difficult to foil than any before. America is well served by its law enforcement and national security officials, who have succeeded in stopping the overwhelming majority of planned strikes. They are our last line of defense. But they can't be everywhere at once, and the jihadists know it. Dr. Walid Phares is a senior fellow with the Foundation for Defense of Democracies and the author of "Future Jihad: Terrorist Strategies Against America."